New Moon 06.16.2015: In Gemini. What is the message? New Moon 06.16.2015 @ 25 deg. Gemini 07 min. 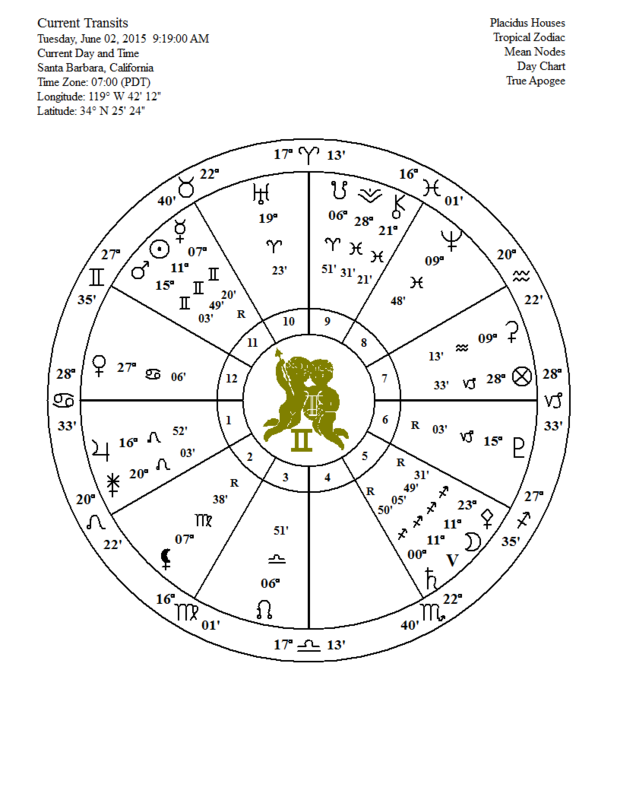 EDT 10:05 a.m. PDT 07:05 a.m.
As this New Moon is in Gemini we ask what is the ‘messenger of the gods’ up to? That is Mercury, ruler of Gemini (and Virgo) known as Hermes in Greek mythology, the son of Zeus, king of the Greek pantheon and Maia the eldest of the seven sisters that are the Pleiades. On the 11th of June Mercury went direct allowing us to resume communicative activity without delay or interference. In fact with Mars conjunct the luminaries for the next few days the intellect, razor sharp, may zip through tasks and seek more to do–especially anything that directs one toward the ‘big picture’. The underlying structure of the New Moon at 25 degrees Gemini is an exact grand trine (3 planets 120 degrees from each other) involving Uranus in Aries (evolution and illumination), Jupiter in Leo (generously and compassionately spreading the word) and Pallas Athena in Sagittarius (wisdom and ‘defense’ of Truth or upholding Truth). Profound underpinning that energetically circulates the essentials of the ‘big picture’=illumination, compassion and Truth with ease and grace, the nature of a grand trine—energy moving in a continuous flow–a passion for eliminating that which is not balance and harmony. This is a fire grand trine so plenty of energy to move us along. The nature of Mercury is changeability. 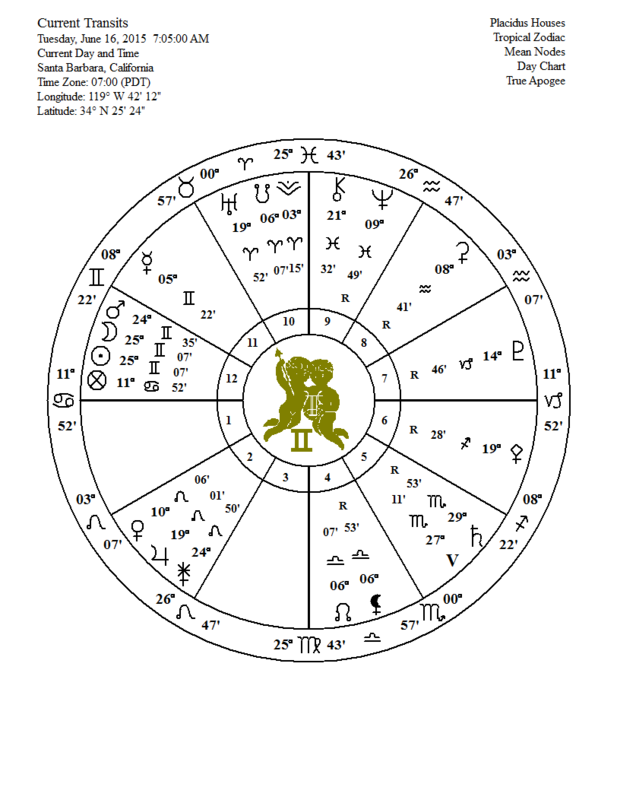 The sign Gemini is mutable indicating an ability to move quickly from one experience to the next as we continue to dance our way through all that fascinates us here learning the art of detachment and continuing the journey. Although 6 planets are mutable in this chart, Saturn returning recently to Scorpio (a fixed sign) from Sagittarius offers a serious anchor for those who might otherwise feel ungrounded and another opportunity to examine whatever lies hidden hindering our ability to leap when necessary. Saturn completes its retrograde motion August 1st on the west coast and August 2nd on the east coast at 28 degrees Scorpio 17 minutes. As Scorpio represents the cycle of humanity birth, death, rebirth and regeneration there is a desire to understand this cycle as a relative experience; that our true nature is that from which this cycle emanates, not the cycle it self. When we realize the essence of duality, our truth is simultaneously known. Gemini, the twins, implies two whereas the Truth is ‘not two’. However, the experience of two is necessary in order to recognize the Absolute. Here two exist within one and the motivation toward dissolution of the notion of separation is what drives us to seek many experiences. At this time assistance to successfully attain our goal appears in Black Moon Lilith at 6 degrees Libra and conjunct the North Node (where we strive toward). In Libra the quest is balance in the environment that results in stillness in the inner environment. Stillness, peace is the absence of thoughts to which we are attached that create ‘not peace’. The Black Moon, the darkest depths of space, inherently knows stillness and all that does not contribute to this looms large in our field. Almost with exaggeration does the influence of BML move us from ego based desire and fear toward a place of pure observation and living without editing what shows up on the screen based upon patterns from the past that have nothing to do with this present moment. BML trines Mercury within a degree so that subliminal messages can be expected. It may not be obvious what motivates some of our actions over the next few days but we may be sure that these actions will be supporting our highest good. Therefore trust your self and any insights you have now and always. You will see clearly that this is the easiest, most graceful way to be here. Everything occurs even without our constant need to manipulate and control. The message is to deeply focus on, not what moves and changes but that which does not; that which is the fabric of the fabric. The intellect that directs us, may carry us to the edge of what is known of physical reality but it can not take us to what we are and have never not been. When the intellect directing ceases to be the authority we are free to Be without the supervision of a limited source. We are free as unlimited source. Absolute, all that is. How can that be not okay? Limitation is a concept pertaining to duality. It is the result of thinking there is any one that may be limited. Limitation is a judgment and confines us to the never ending search for “perfection” when that is our natural state. If we think we are not, then naturally we will seek that. And as we perceive my self in relation to others then we will begin by seeking outside of our self for what will contribute to our sense of perfection. I must be more, better or different than I am now. This Full Moon in Sagittarius is involved in a mutable cross (4 planets that square each other and two sets of opposition). Mutable relates to the quality of the signs these four planets occupy. Mutable signs allow change. They are flexible and apt to go with the flow; the wind that has no limitations. The wind in a windstorm has been used to describe a mutable grand cross. There is a great deal of tension inherent in a grand cross. It is a dynamic configuration that is highly motivated to seek resolution to the discomfort of the tension. In this case with the Sun/Moon in opposition, Neptune and Black Moon Lilith in opposition and all squaring each other the way to ‘peace’ is through recognition of Truth that lies at the ‘center’ of the square. Deeply situated in a ‘place’ that transcends all of the thoughts that I am this or that or anything to do with a Grand Cross is the knowing that these thoughts are my limitation. In the Grand Cross I bump up against my self creating my self outside of or appending my true nature. In the windstorm the only ‘place’ to rest is in the eye of the storm, the center, the one place where I sit in stillness knowing that ‘this too shall pass’. It is just a storm. It tugs at the hair and clothing but has no effect upon “that” which is everything and nothing and exists still, even when the storm has passed. Let it be therefore and be “it” and unattached to the storm that ceases to exist as quickly as it arose. With Neptune standing in opposition to the Black Moon Lilith there is a desire to defy limitation or ignore it as a manifestation of duality. Black Moon entices, draws from Neptune the greatest gift the ruler of Pisces offers and that is dissolution—of beliefs that structure our world. The solution is dissolution and in the environment that is the realm of this frozen giant, the winds that rage at 1500 m.p.h., the fastest in this universe, dust will never settle. With Mercury and Mars conjuncting the Sun (All in Gemini. There are 8 planets of 11 in mutable signs) there is ample energy directed toward experiencing and then moving to the next experience with the result quickly arrived at—been there done that, been there done that and that—reminding ourselves as mercury is still retrograde that I’ve hit my head against the wall enough times to recognize the way through this is not any of the ways that I have tried in the past. And therefore, what is it? By doing nothing except accepting what is, in this moment, as an expression of the Absolute Reality occurring in physicality. We think it is so difficult, that we need to bash into our selves to get it but the opposite is true. “Sit’ in silence and be free. Thoughts will come and go—so. They have nothing to do with me; that is Reality. All those thoughts are a product of the past and are not relevant here and now. Let the winds sweep you away and know that it has not the ability to alter “that” our true nature. All the challenges that may arise as a result of any tension at this time are merely showing up as an image on a screen that I project based on what I deem to be real—that which I identify with; the accumulation of patterns that have fallen upon these shoulders that is all part of a story with which I identify—an illusion as there is no individual for whom this can be true. There is only ‘source’ everywhere and everything Being. In the midst of clashing molecules form arises. We understand the eternal nature of the ‘abiding’ that precedes all physical existence. Mutable=flexibility, going with the flow that allows all things to appear on the screen of reality and to quickly pass away. Grand Cross=dynamic, motivation to resolve tension. I’ve tried everything! What’s next? The realization that ‘I” am that which is still. At 11 degrees we know that “we” is all one and make every effort, no stone unturned, to overcome the limiting confines of relative perception. 11 is a master number where we first grasp freedom beyond separation–not two.